In evaluating survey results, researchers often compare responses to multiple questions, this process is called multivariate analysis. The most common way to do this is using cross tabulation. Cross Tabulation enables researchers to find correlations between responses to different questions. For instance, in a study Qualtrics conducted, we found a correlation between how often people worry about specific political issues and how they voted in the 2008 election. Cross Tabulation can also be useful in reviewing customer feedback. For example, a retail store could find that a strong majority of those who are dissatisfied with the store’s service purchased a specific product or worked with a specific employee during checkout. In either case, the store could quickly and easily remedy the issue. Cross tabulation is available in the Qualtrics Research Suite and can be performed very easily. Once in the View Reports tab, users need only to click on the “Cross Tabulation” icon, and they will be taken to a wizard that will walk them through creating a cross tabulation. 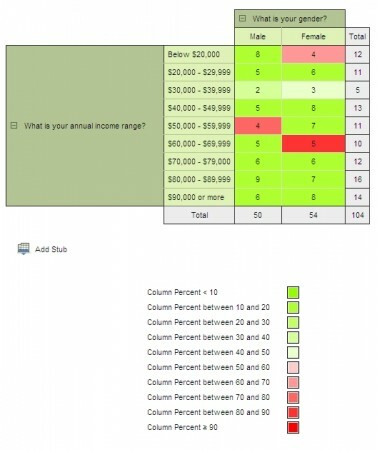 The cross tabulation feature in Qualtrics allows users to highlight data that meets specific criteria. The highlighter uses a customizable color scheme and can follow any rules the user creates. Cross tabulations built in Qualtrics automatically include a separate table that calculates chi-square and p-value for each set of questions. All of these features make cross tabulation possible for even a novice researcher. We encourage all Qualtrics users to take a look at the cross tabulation feature and contact us if they need any help using it.